New Delhi: Education Minister Manish Sisodia on Wednesday announced that all schools in Delhi will remain shut till Sunday as the capital city’s air quality was worsening. “Due to the deteriorating air quality in Delhi, the health of children cannot be compromised. We have ordered the closure of all the schools in Delhi until Sunday,” Sisodia tweeted. The Aam Aadmi Party (AAP) government had on Tuesday directed that primary schools would be closed on Wednesday. It had also ordered suspension of outdoor activities for secondary classes. The decision to shut all school for this week came after the Air Quality Index (AQI) touched 484 on Wednesday. “The air pollution has become unbearable affecting all. It has engulfed the city. The reasons for this may be varied from stubble burning in Haryana and Punjab to vehicular/construction pollution but the fact remains that it is affecting the health of Delhi’s citizens,” an official order from Sisodia’s office said on Wednesday. “The situation shall be reviewed on Sunday,” it added. A thick layer of smog canopied the national capital early on Wednesday morning, leading to hazardous pollution levels. Various areas, including Dwarka, India Gate, Dhaula Kuan and RK Puram were covered with thick smog. Taking into consideration the severity of air pollution in the NCR-Delhi region, a Supreme Court-appointed panel on Tuesday recommended immediate enhancement of parking fee by four times. The decision was taken at a meeting of the Environment Pollution Prevention and Control Authority (EPCA) to tackle the issue of rising air pollution by discouraging people from using private vehicles. The EPCA panel has also recommended re-introduction of odd-even scheme for private vehicles based on license plate numbers with minimal exceptions. Earlier on Tuesday, Delhi Chief Minister Arvind Kejriwal said the capital city of India has become “gas chamber”. In view of rampant air pollution, people at various places in Delhi are wearing masks during morning walk. School students are finding it hard to commute with fall in visibility and air quality as moisture combined with pollutants shrouded the city in a thick cover of haze. “I am wearing a mask as my throat is itching because of the smog,” Raja, a school student said. Another student said, “We are facing problems. I have been experiencing itching in my eyes and throat”. 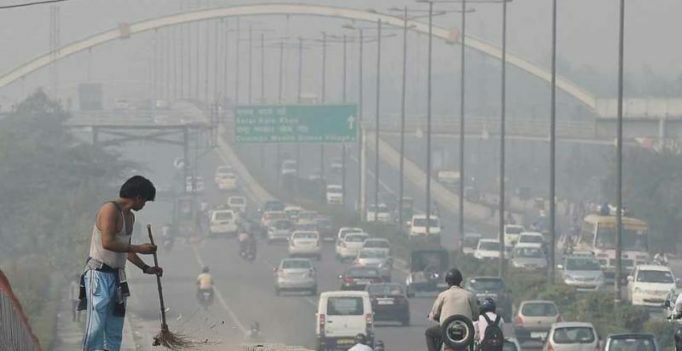 In the wake of Indian Medical Association (IMA) declaring “public health emergency” in Delhi due to hazardous pollution levels, experts have warned people to avoid outdoor physical activities like cycling and jogging.